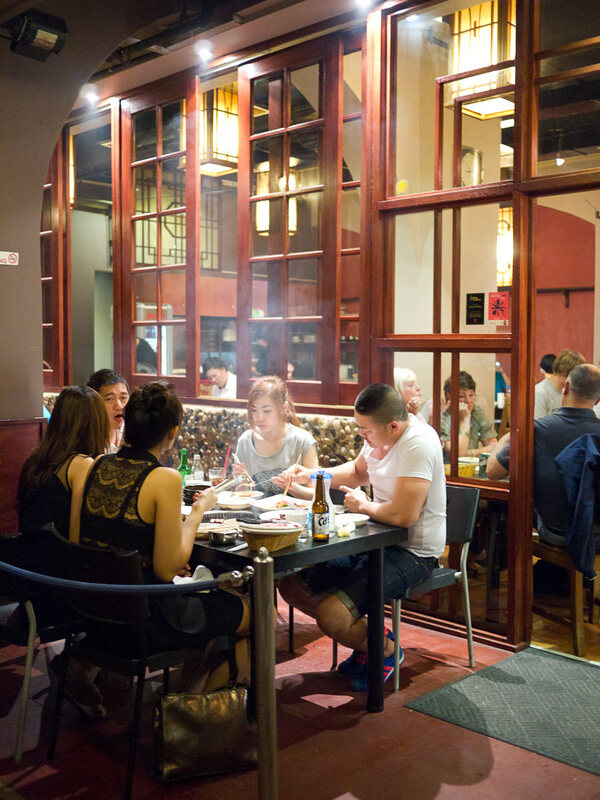 Follow the aromas of charcoal smoke and garlic down a laneway off Pitt Street between Liverpool and Central Streets, past the walls adorned with graffiti art, and join the dinner queue for Korean BBQ at Sydney Madang. 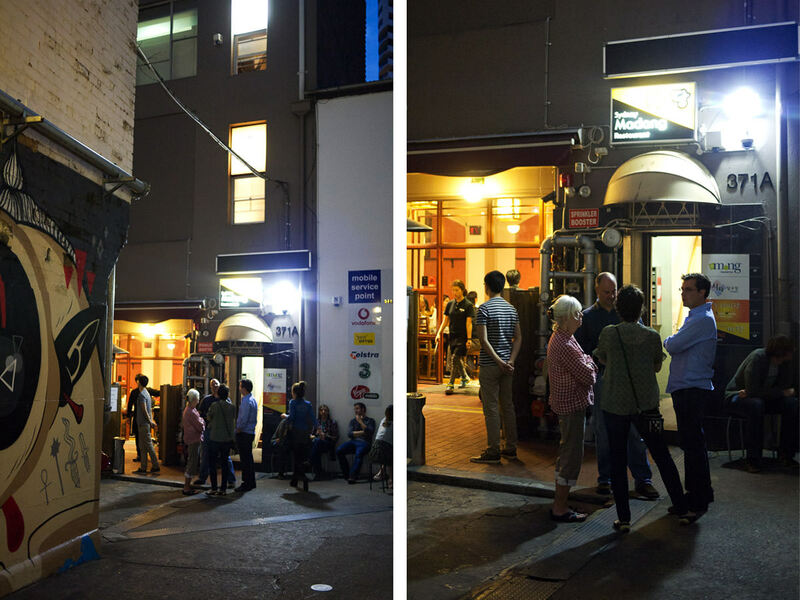 Every day of our holiday so far, we’ve passed the yellow, black and white Sydney Madang sign as we walk up and down Pitt Street, but it’s Chef Josh of Cafe Ish who convinces us it’s worth venturing down the dark laneway. There, Juji, Jay and I find a small crowd patiently waiting to be admitted inside, some standing, others sitting on stools. Despite its tucked away location, it’s abundantly clear that Sydney Madang is no secret to Sydney locals. We’ve been warned: if you arrive after 6.30pm, be prepared to join the queue. After a wait of about 20 minutes, we follow a staff member into the busy restaurant, weaving our way to our allocated table in the corner next to the kitchen. 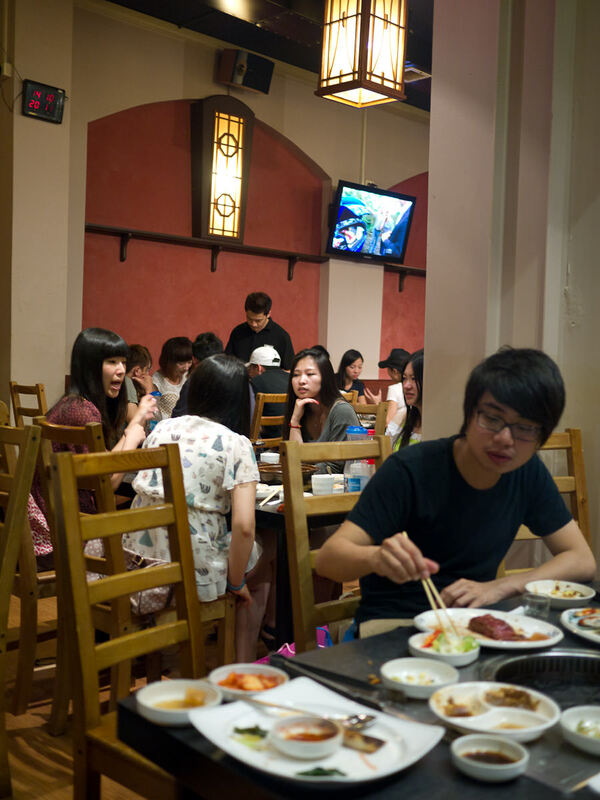 All around us is conversation, laughter and the click-clack of chopsticks. 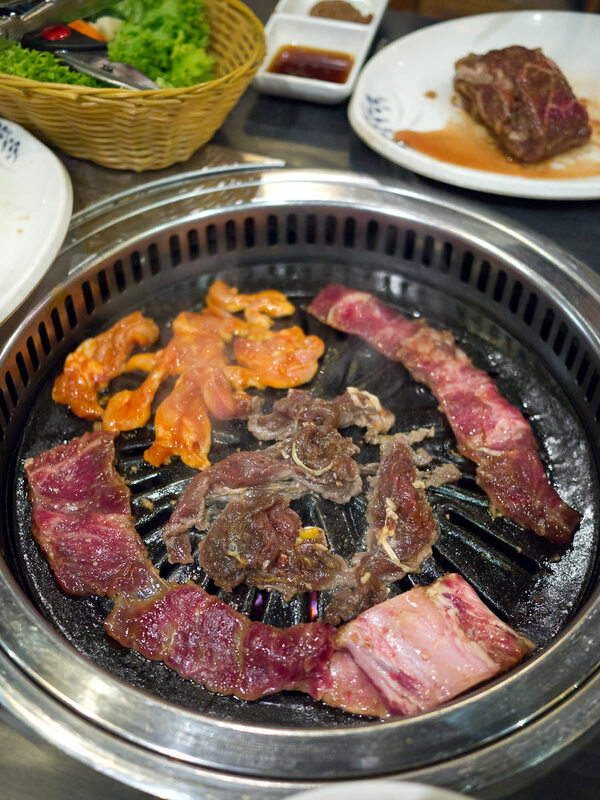 The air is thick with mouth-watering smells and the sounds of sizzling barbecue. 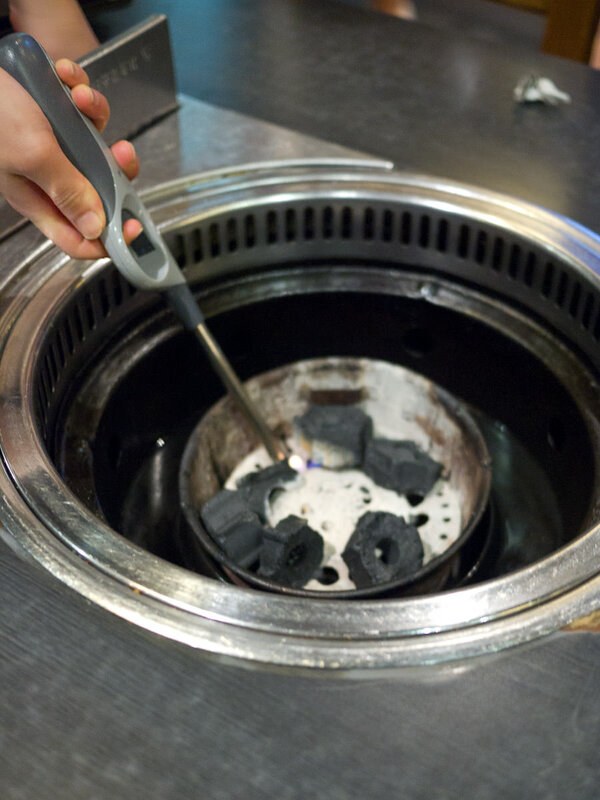 We place our order and a staff member lights our barbecue, which runs on gas with added charcoal for fragrance and flavour. Once the blue flame has been lit, a clean hotplate is placed on top. Jay orders a bottle of soju and we all admire the Elvis-esque (or is it Rick Astley-esque?) Korean singer pictured on the label. 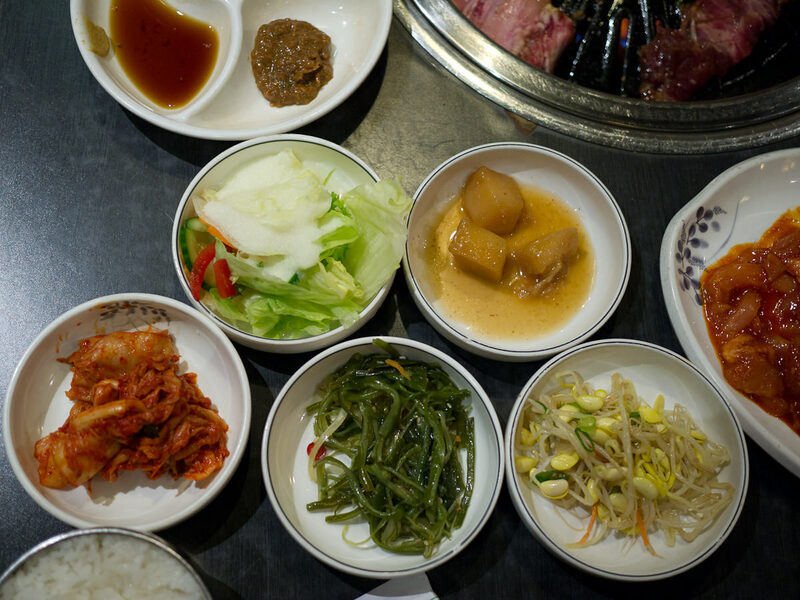 Our plates of marinated barbecue meats arrive, followed by hot steamed rice (AU$2 per bowl) and complimentary banchan (side dishes). 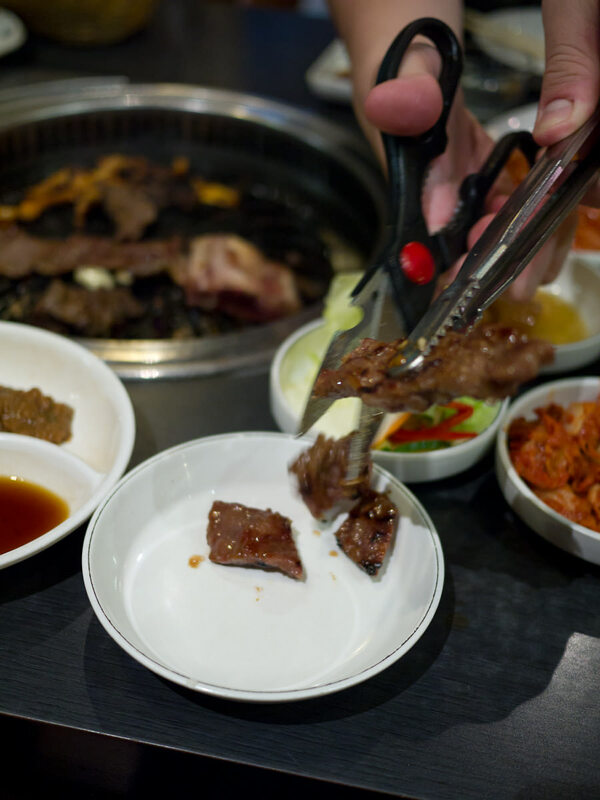 We are given a pair of tongs to cook with, and a pair of scissors which we use to chop up the beef ribs. 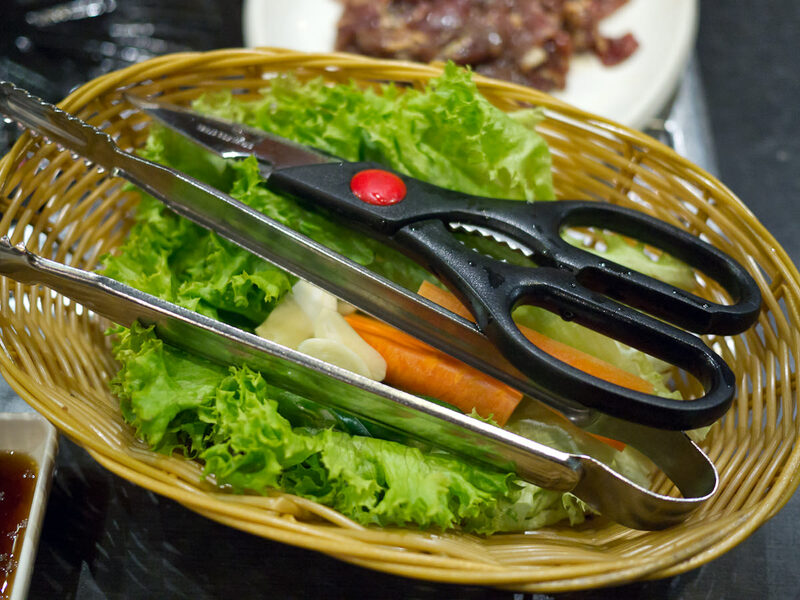 The tongs and scissors are delivered in a basket filled with lettuce, carrot and whole garlic cloves. 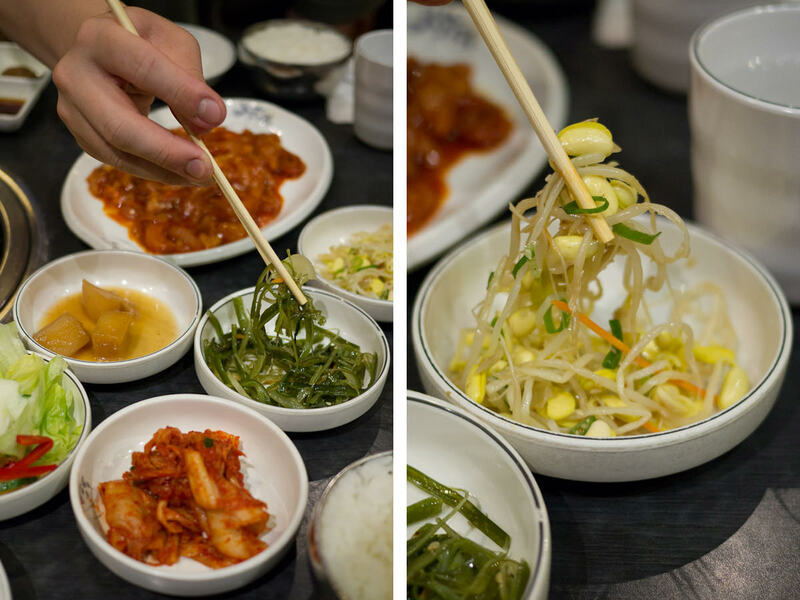 The banchan includes mung bean sprouts, kimchee, a salty bean paste, garlic oil, spring onion, boiled chunks of marinated potato, cold mashed potato salad and crisp garden salad (lettuce, carrot and capsicum). 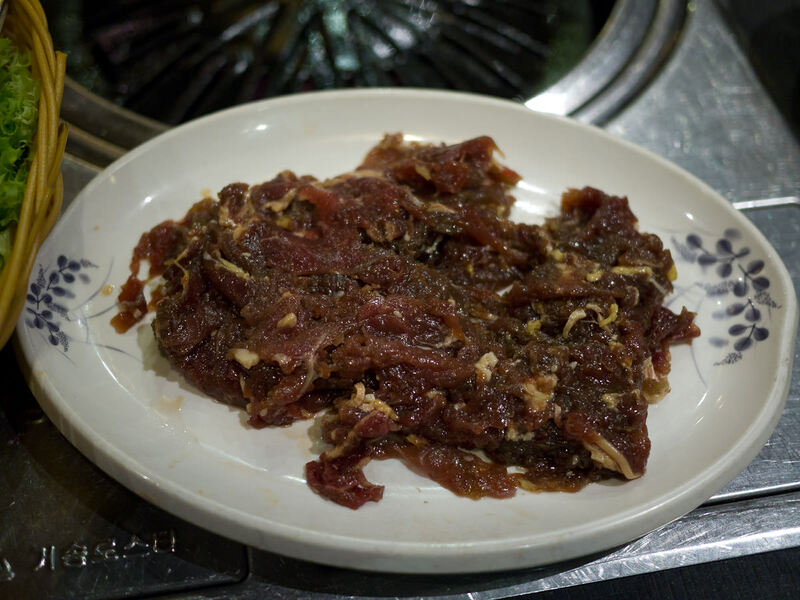 We waste no time in loading up our hotplate with the thin ribbons of marinated meat and whole garlic cloves. The smells are dangerously enticing. I can’t resist leaning close for a good look and sniff – well, I shouldn’t be surprised to discover (the hard way) that the barbecue spits. We all take turns with the tongs. It’s fun but also torture waiting hungrily for the meats to cook right under my nose. Patience is a virtue, but I am neither patient nor virtuous. 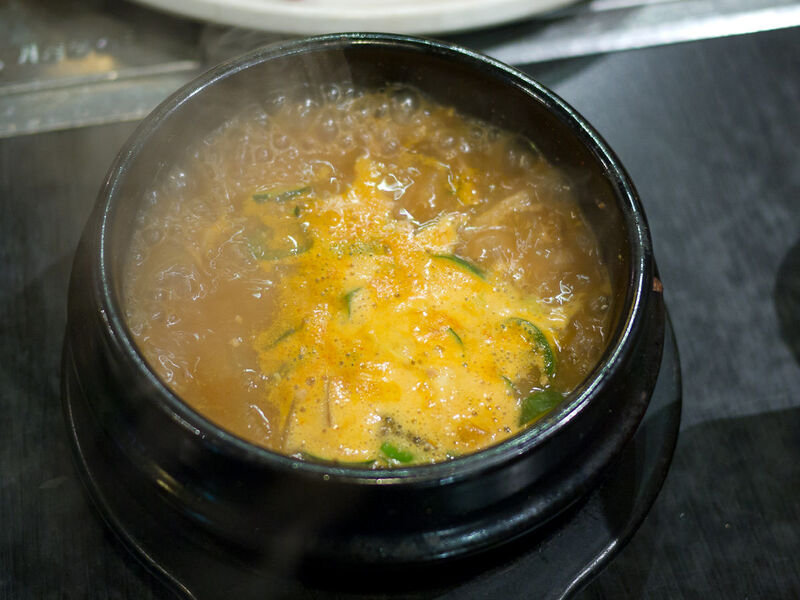 We share a serving of doenjang jjigae, a soybean-based stew, which arrives molten hot in a black pot. We leave it to cool down while we tend to the barbecue. 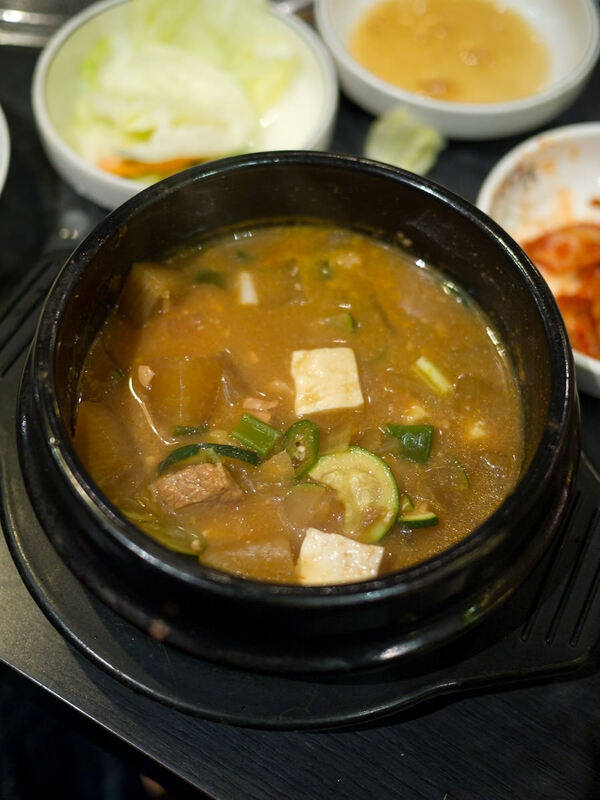 When the bubbling has subsided, we are delighted to discover a hearty broth with soft white chunks of silken tofu, potato, thinly sliced zucchini, fresh green chillies and pieces of tender slow cooked beef. It’s not as fiery in taste as its initial appearance suggests, but there’s a gentle heat in every savoury mouthful. 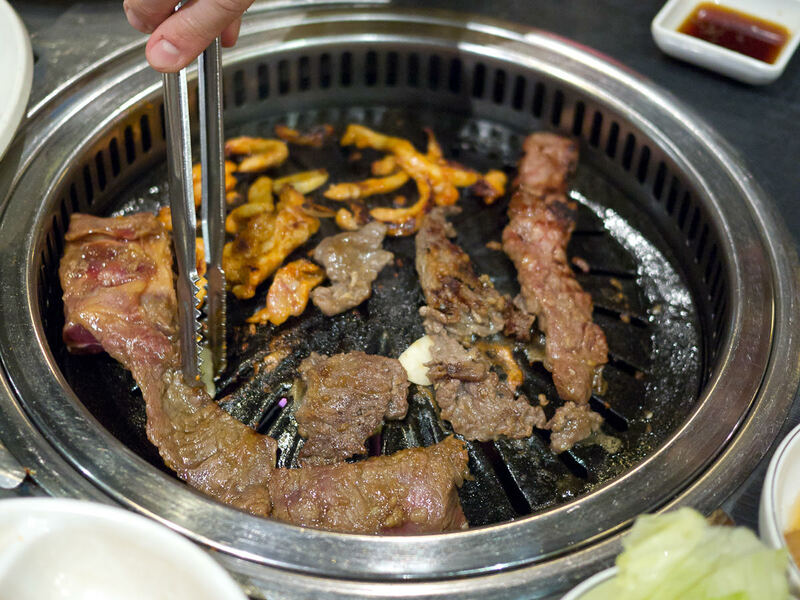 The staff are ever watchful for dirty hotplates that smoke too much from the remnants of charred marinades – they are quick to replace them throughout the meal. As soon as our latest grill plate gets smoking hot, we load it up with more meat. This process repeats until we have cooked and eaten all the meat. 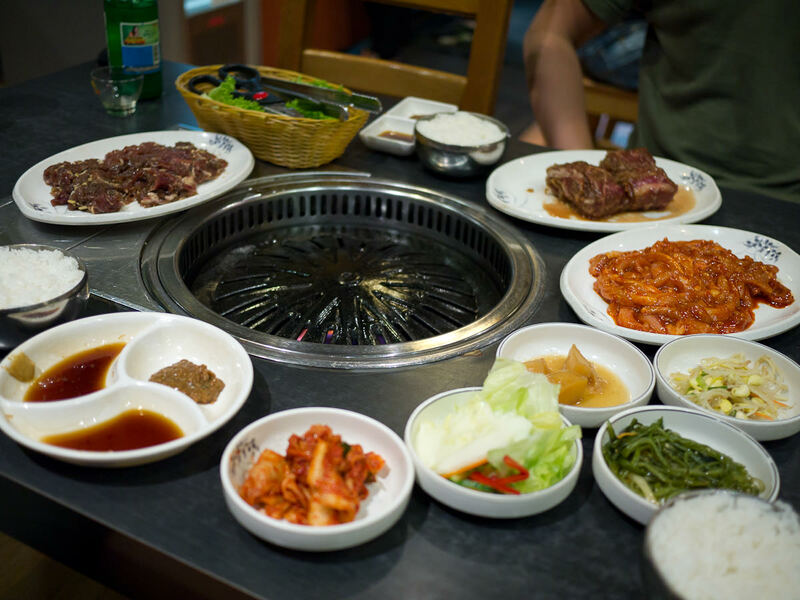 Korean barbecue is a great choice for group dining. The shared enjoyment from cooking your own dinner at the table makes for a fun meal. We leave Sydney Madang happy and satisfied, the smells of barbecue and garlic clinging to our clothes and hair. 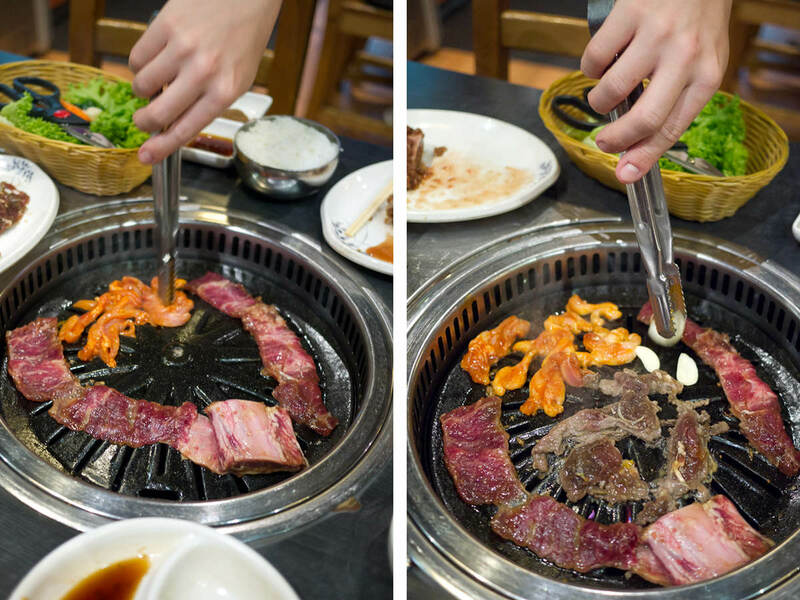 Are you a Korean barbecue fan? What are your favourite dishes to order? 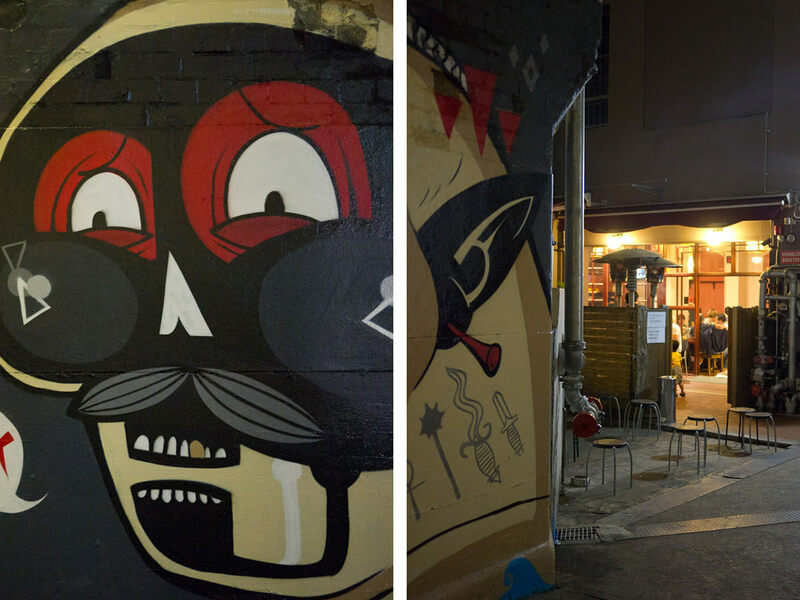 Graffiti art and empty stools outside Sydney Madang – everyone’s inside eating! I went to Sydney with my sister Juji and her fiancé Jay in November 2011. 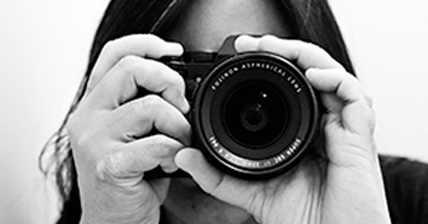 See the list of posts so far, in reading order. There’s a whole lot more to come.